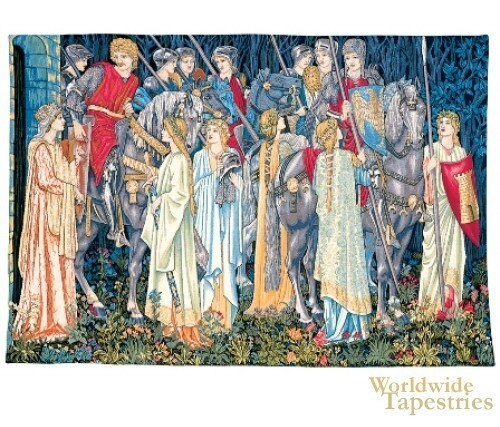 Holy Grail tapestry depicts a scene from a medieval legend that is much loved. Here in this work based on the famous scene by Morris and Co, the original of which was woven in 1895-6. Here we see a scene where the knights of the Round Table depart for the quest for the Holy Grail, among which are Sir Bors, Sir Percival and Sir Galahad who reach the final scene of the quest, where ultimately it is Sir Galahad who enters the chapel where the Grail is held, surrounded angel guardians. The scene is full of color and movement, a signature of the works of Morris and Co. In this work, the usual colorful forest flowers and floor, is contrasted by the blue forest trees in the background representing the night into which they are departing into. This "The Holy Grail II" tapestry is backed with lining and a tunnel for easy hanging. Dimensions: W 40" x H 27"
Dimensions: W 56" x H 40"
Dimensions: W 80" x H 54"
Dimensions: W 136" x H 108"